This is a taster of what i get up to on my guiding sevices. If you would like to book a session, check out my site joelsoul.co.uk, my contact details are there along with prices. 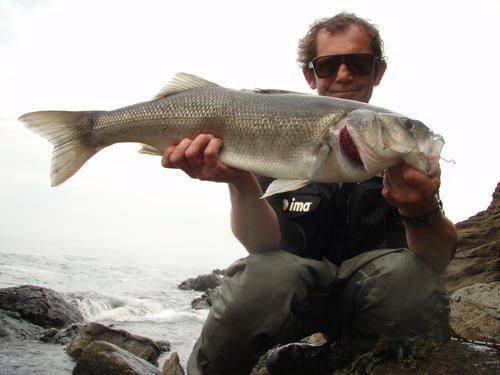 I have plenty of availabilty for the season, so get in early to book up the best tides. The fishing is good so why not come and share some with me. Had a chance last sunday to get out for an early one, tides and conditions looked bang on, so i was itching to get out there. On arrival to my mark things looked good, light winds, 1 to 2 ft of swell pushing and clear water, perfect. I hadnt fished this mark for awhile and its like visiting an old freind, the knowledge of the underwater scenery clicked in and i was quickly casting shallow running lures through the edges of one of my favourite gullys. As often is the case you cant always tick all the boxes, weed !, which has gone crazy with the rising sea temperatures, 14 degrees, so i texas rigged up a gold flash Keitech Eay Shiner 4 inch with a lead cone to get it down where the fish would be. Cast out, let it sink, then a slow sink and draw back, fish on !, just a small one but encouraging that the technique was working, just need to find its granny !. Next cast same thing, but slower, wallop ! !, fish on, the drag was singing and it was obviously a good fish, keeping deep with powerfull runs, right lets get her in, coaxing her away from potential disaster i got my first look at her, heart pumping full of adrenaline she was nearly mine, a few last runs then in i went and she was mine. Picking her up and feeling the weight i knew she was a good lump. So a few quick shots then measured, 73cm !, result, around the 9lb mark, a beautifull fish in great condition, heart still pumping, it was time to get her back home, swimming off strongly . 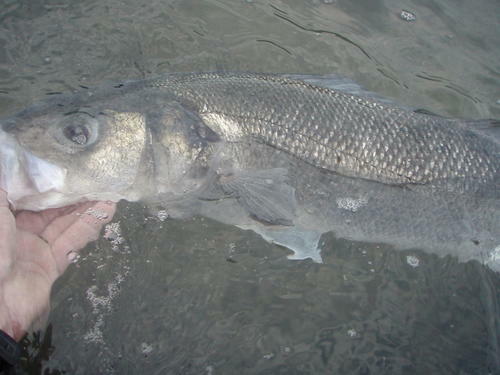 As always when youve had a good fish, its like a state of shock, so i just sat there and thanked the sea . 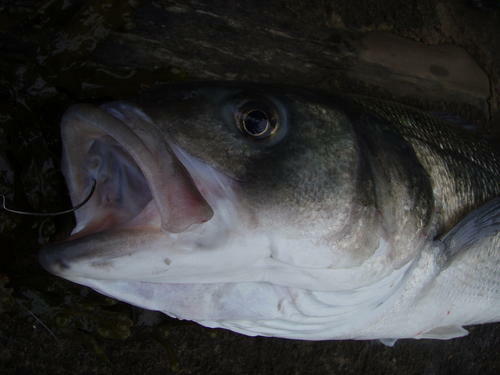 Three Bass and i will give you a call ! 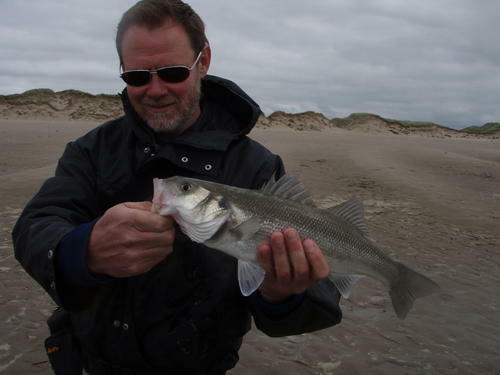 Had a guiding session last thursday with one of my regulars Martin Rawle. Martin was keen to have a go at some of the soft plastic fishing i have been doing of late, to see if it would be worth having a go on his own patch. So it was a case of running through the methods, times and tide were chosen for the right time of when i felt the fish would be there. 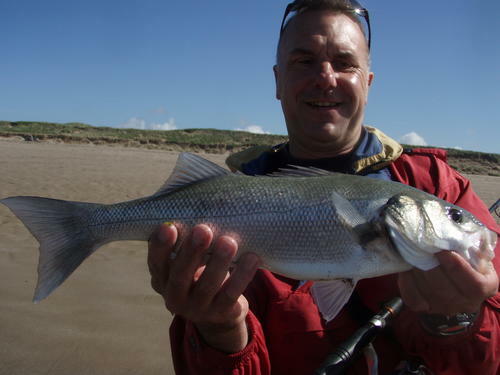 Even with blazing sunshine we managed 6 fish and Martin bagged his first Bass of the season and what is most important he now has the confidence to believe in this method. Martin said he would give me a call when he had bagged himself 3 fish on this method on his home patch. im sure it wont be long !. 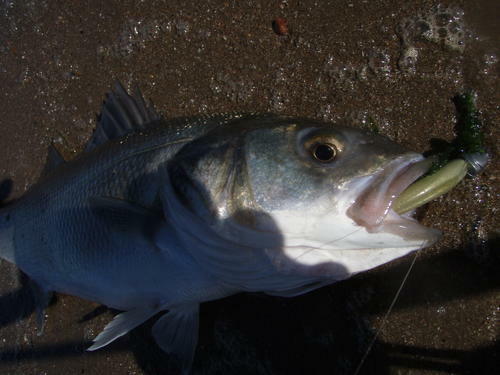 Lure of choice was the Keitech Easy Shiner 4 inch in Ayu, the sea temperature has jumped to 14 degrees. I had the pleasure of guiding Dave Cowell last sunday. Daves been one of my regulars for the last six or seven years and like most of us is addicted to his Bass Fishing. As the fishing has been pretty good of late i contacted Dave to get him booked in for a short session, pretty confident id find us a few fish or two. Well it turned out to be a cracking session with 15 fish landed between us, the largest going 62cm, all falling to the Keitech EasyShiner 4 inch in ayu, rigged up to an Iwashi 14 gram jighead, with a long 8 lb fluro leader. Needless to say Daves been on the phone recently itching to get back out for some more action ! !..